This book explores the theoretical contribution of Michel Foucault to the fields of criminology, law, justice and penology. 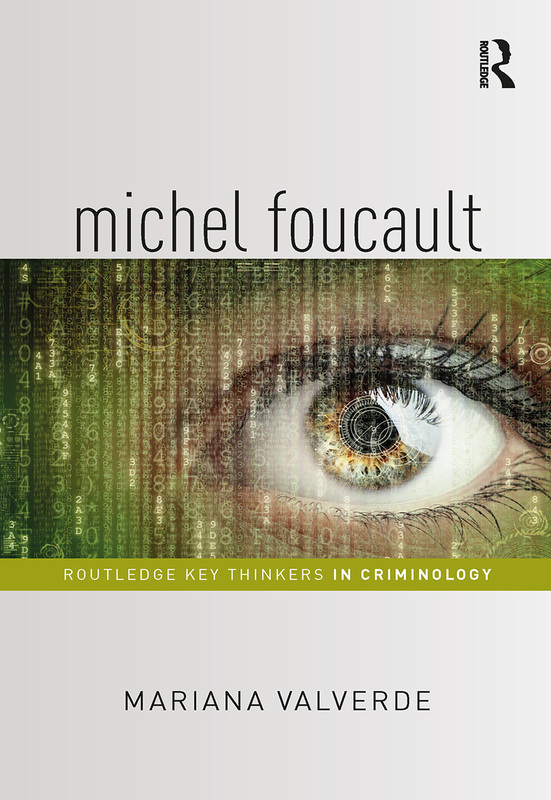 It surveys both the ways in which the work of Foucault has been applied in criminology, but also how his work can be used to understand and explain contemporary issues and policies. Moreover, this book seeks to dispel some of the common misconceptions about the relevance of Foucault’s work to criminology and law. Mariana Valverde clearly explains the insights that Foucault’s rich body of work provides about different practices found in the fields of law, security, justice, and punishment; and how these insights have been used or could be used to understand and explain issues and policies that Foucault himself did not write about, including those that had not yet emerged during his lifetime. Drawing on key texts by Foucault such as Discipline and Punish, and also lectures he gave at the College de France and Louvain Criminology Institute which offer a more nuanced account of the development of criminal justice, Mariana Valverde offers the essential text on Foucault and his contribution and continued relevance to criminology. This book will be important reading for students and scholars of criminology, law, sociolegal studies, security studies, political theory and sociological theory. "Mariana Valverde has written a characteristically erudite and lucidexposition of Foucault’s writings as they bear on criminology and socio-legal studies. Resolving important points of confusion in Foucault scholarship, she develops important new insights into Foucault’s work. Her path-breaking analysis suggests radical revisions to our thinking about the nexus between law and other forms of truth telling. In the process, Foucault’s problematic relationship with criminology is shown to be more complex and ambiguous than most ‘critical’ criminologists have supposed. This is a book whose value and importance far outstrip its brevity." "Interpreting elements of Foucault’s vast oeuvre, this book questions standard readings of some key ideas and their relations to one another — sovereignty, discipline, governmentality, biopolitics, pastoral power, avowal. Its succinct expression presents an accessible framework without simplification, and invites its readers to contemplate a critical criminology with and after Foucault." "Mariana Valverde discusses how Foucault revolutionized the study of power, prisons and crime in a way that is convincing, highly accessible and sensitive to historical context. Based on an erudite reading of Foucault (often forefronting the recently published and for this reason least discussed lectures) and a wealth of examples, she shows the continued productivity of the approach. The reader gets an unprecedented apprehension of the context-bound ingenuity and the open-ended logic of Foucault’s work within and beyond core areas of criminology." "That Valverde is an expert guide to Foucault’s work and its application is unquestionable. Her command of the field and its many facets is apparent. Moreover, she simultaneously (and very adroitly) avoids burdening the discussions of Foucault’s work with detail, while also ensuring not to oversimplify. This makes understanding Foucault’s work, particularly in an introductory text which covers much ground like this one, significantly easier. Valverde’s coverage of several recently published lecture series and other more obscure or overlooked texts also expands considerably the ways that Foucault’s work may be taken up by others. It not only offers signposts for deepening existing Foucaultian scholarship in criminology and criminal justice but also opens up new possible directions… Valverde has succeeded in drawing together an incredible amount of scholarship and has effortlessly synthesised this to produce an accessible and engaging book. Not only will students and researchers of criminology and socio-legal studies find something useful in this text but those who are already familiar with Foucault’s work are also bound to gain new insights into the relevance of his work for understanding practices of criminal justice." Mariana Valverde is Professor of Criminology at the University of Toronto. She is the author of Chronotopes of Law: Jurisdiction, Scale and Governance (Routledge, 2015) and Law and Order: Images, Meanings, Myths (Routledge, 2006). The more a discipline matures and develops the more interesting it becomes to document and reflect upon its history – including its key figures. The history of criminology includes a set of key thinkers who have defined the subject, renewed its theory and refined its methodology. The volumes in this series are stand-alone introductions and critical examinations of the life and work of key thinkers in criminology. These volumes collectively contribute to writing and rewriting criminology’s history by adding a distinctive line of inquiry: the focus on the ideas of some of the most inspiring figures from its past.